It wasn’t quite a TomTom on two wheels, but it was still a revelation for anyone who had spent hours working out the quietest or fastest routes from A to B on paper. And it was free. What more could one reasonably ask for? Anyone who answers “a free app with turn-by-turn navigation, 3D mapping, and a voice telling me what to do” is likely to be pleased with the Bike Hub app for the iPhone and Android phones. 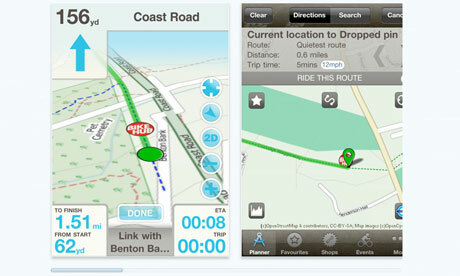 Anyway, Bike Hub also offers 2D maps, and it’s a bit churlish to grumble about an app offering too many features. Besides, it’s free. Free! Some people have been known to complain that free apps, if they prove inadequate, are a rip-off in terms of time spent downloading and then de-installing them. To me this sounds a little bit like a child at a birthday party taking a bite out of every sweet in a 4kg tin and angrily spitting out the chocolate brazils, but anyway – if you fear being ripped off by Bike Hub, don’t. Like CycleStreets, it will offer you routing via what it calculates to be the quietest route, the fastest or a balance between the two. In my experience, the “fastest” can actually be slower than the shortest route; but Bike Hub usefully offers a “shortest” option as well. The app also ties in with the Bike Hub network of bike dealers nationwide, with the option to find shops nearby – useful if you break down. And for its final trick, it promises that you don’t actually need to look at the screen at all to follow the GPS, which would be a big benefit. The phone vibrates as you approach a turning, and tells you what to do. Perhaps it’s louder on other models of iPhone anyway (I have a 3G), or on other smart phones (as this app is now also available on Android). Post your experiences below.